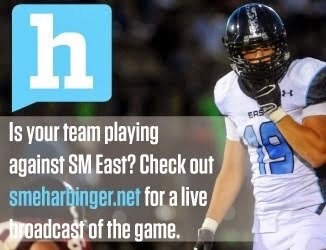 courtesy Hailey Hughes, SME Harbinger. Juwann Potts, Leavenworth: Potts had a career night on Friday at Lawrence Free State. He first put the Pioneers on the scoreboard in the first quarter with 95-yard kickoff return for a touchdown. He followed that up with a 30-yard touchdown reception in the second quarter to put his team up seven, and he opened the third quarter with a 94-yard kickoff return for a touchdown. Potts finished the game with over three hundred yards of total offense, in addition to the three touchdowns and an interception. Wyatt Edmisten, SM East: Edmisten is a touchown machine, and he had one of the best games of any Lancer in a long time this past week. 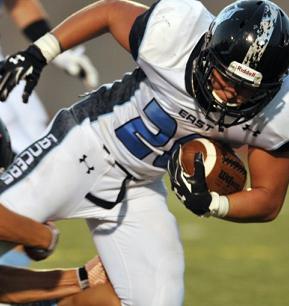 Against rival SM West, Edmisten carried the ball 22 times for 129 yards and five touchdowns. The five scores gave him 12 touchdowns for the year, which ties him with Olathe South's Jake Seurer for the most in the league. For the year, Edmisten has run the ball 70 times for 429 yards. Mark Littrell, Leavenworth: Littrell and his staff get the top honors this week, and rightfully so. Coming off consecutive losses (where the Pioneers had only managed 19 points) Leavenworth came out of nowhere in week four. Traveling to Free State is never an easy task -- and not only did Leavenworth come away victorious, but they also hung 35 points on the Firebirds. The victory tells us the Pioneers are capable of make some noise in the playoffs this November. *Olathe North and Olathe South did not submit defensive stats. Lawrence and Free State did not submit complete defensive stats. Player of week-- Potts also had a key interception along with the 3 tds and over 300 total yardage. Can we also see qb interceptions - that lends important perspective. Thanks.